As a custom pool builder of over 20 years experience I have been asked this question more times than I can begin to remember. This is the number one burning question for anyone seriously considering the purchase of a new swimming pool. 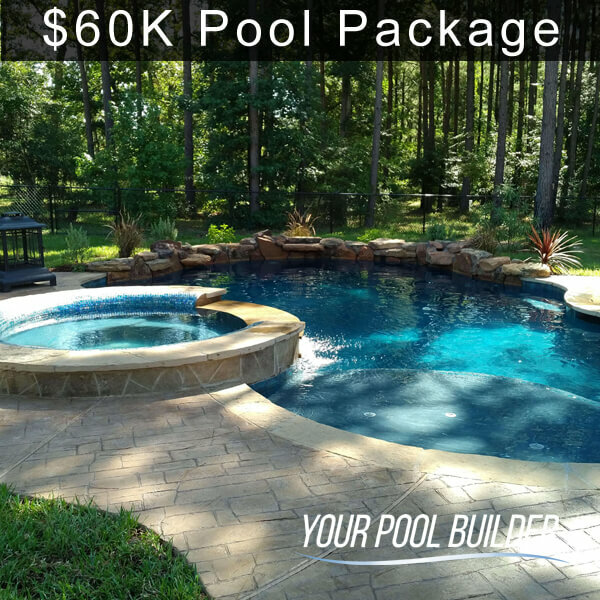 When qualifying the company that will build your new swimming pool you may find a wide range of construction prices based on the design, features, accessories, and maybe even certain products or even installation challenges. There are a number of considerations that contribute to the final price associated with installing a new swimming pool. We offer you straight answers to your budget questions and challenges. The purchase price of swimming pools can (and do) range widely depending on geographical location or region, building requirements, local code enforcement & permitting, and any other variables or construction considerations of your property (where the pool will be installed). Generally speaking when a swimming pool contractor is advertising a price (online or offline) it usually is the base price (basic pool model) and based on the perfect conditions for installation (such as the elevation, grade, zoning, or access) to the property. To a certain extent we tend to agree with Jason, however our sales process and culture is much different than what you may find in the typical car dealership or another swimming pool company office. We should not be pressured into purchasing something that we spend more than 30min each day using, such as our vehicles, homes or backyards. If you are considering the installation of a swimming pool, chances are that you enjoy spending time outside. If you are going to see and enjoy this new pool everyday it needs to be done right the first time! Some aspiring pool owners tend to focus more attention to the end results (must-have items & features) and others may focus strictly on price alone. 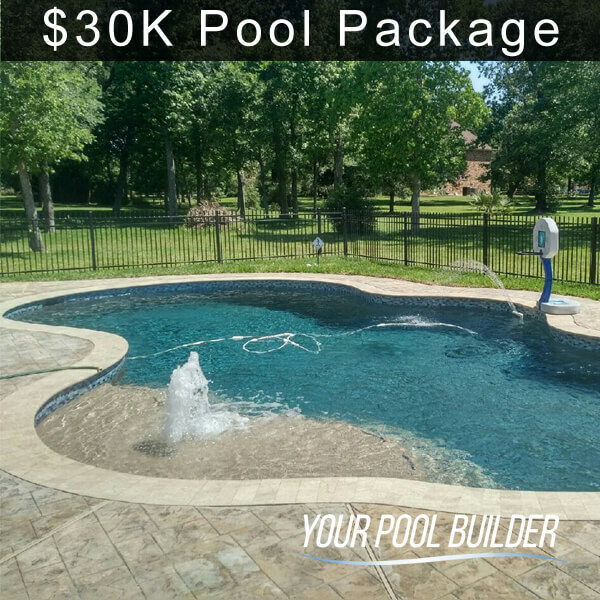 Those who focus their efforts on the price tag of a new swimming pool alone tend to suffer from buyer’s remorse when the awarded lowest bidding pool contractor may have been forced to (or may have offered) inferior equipment, specifications, materials or even omission of details to arrive at the lowest cost estimate. In terms of swimming pool prices; “you get what you pay for” holds a tune in the verse of comparing competing bids. Unlike a vehicle, an inground swimming pool cannot be sold or traded in if you are unhappy with the results. An interesting situation might arise if you are comparing swimming pool construction bids. If you have determined the exact design and features you want and have provided that to each of the competing pool contractors in exact detail and specificity then you may be expecting to receive relatively close range of prices. With all things fair, 2 swimming pools of the same exact design features, size, shape, location (geographical), and curiously these 2 pools are presented with different prices, why so? Unbeknownst to the pool shopper who is comparing these 2 same-spec designs with different prices, the swimming pool contractors have 2 different ideas on how they will build the pool in question. The lowest bidding contractor may consequently provide less gunite, less steel rebar, only one skimmer, bottom drains that tie into the single skimmer line, not provide footings for the decking, mix match your pool equipment for shopping on the cheapest products, or even going bust on your project due to lack of funds! We have seen it happen many times. We have seen a low bidding pool contractor who will lower the price at a moments notice to be awarded the job, beware of this tactic. It leaves one to wonder how much “fluff” or “padding” was originally in the bid, and what exactly are they taking away from the pool design if they lower the price but nothing else changes? This is not any situation a new pool owner should find themselves in. In comparison, the higher bidding pool contractor should have much rhyme-to-reason for the final price with the ability to show and explain why such a price point has been reached. From the technical details to the design & construction challenges, and also itemizing the additions or extras. 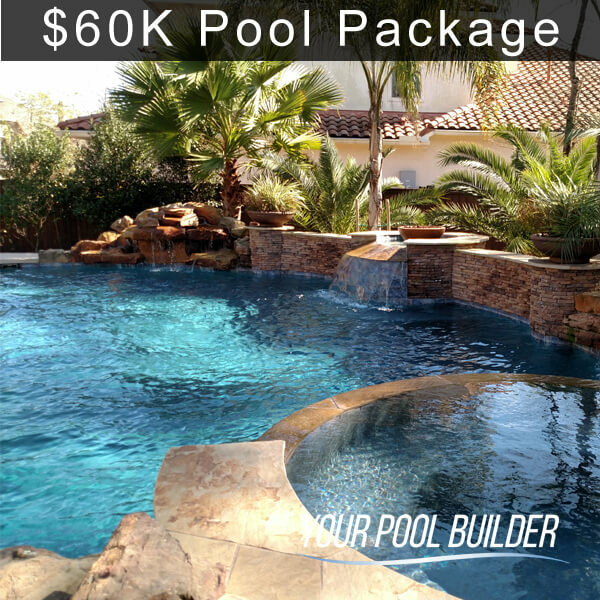 In all cases, “it costs what it costs to build your pool”. 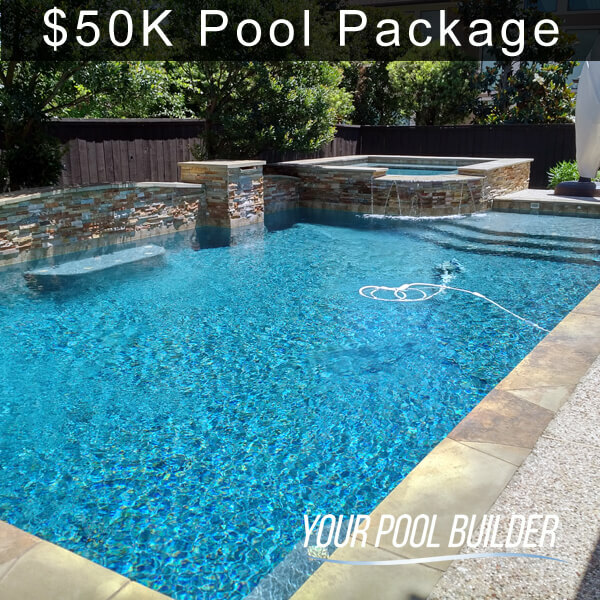 A qualified swimming pool builder will not work for free, their experience is hard earned and just as your’s, their time is valuable and they do this for a living. A swimming pool is a major purchase, the average majority of swimming pool owners go through this process twice in their lifetime. Much like when purchasing a new vehicle or home, you want to know you are receiving a fair deal. After-all, you expect that a reputable company will make a margin of profit on the transaction but in all fairness, would you expect to be shown what those numbers are? Our sales process is developed around a culture of education. 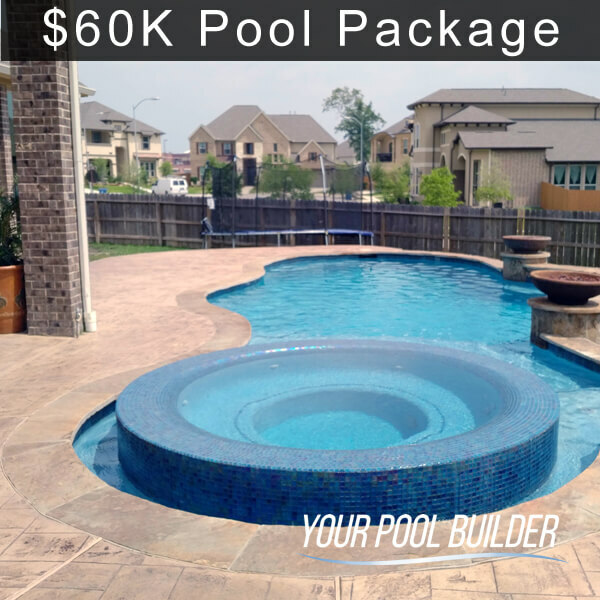 Whether you have owned a swimming pool (or many of them) before, or you are completely new to the swimming pool construction process, it is our goal to build upon your experiences, show you all available options, and base the project on your needs. 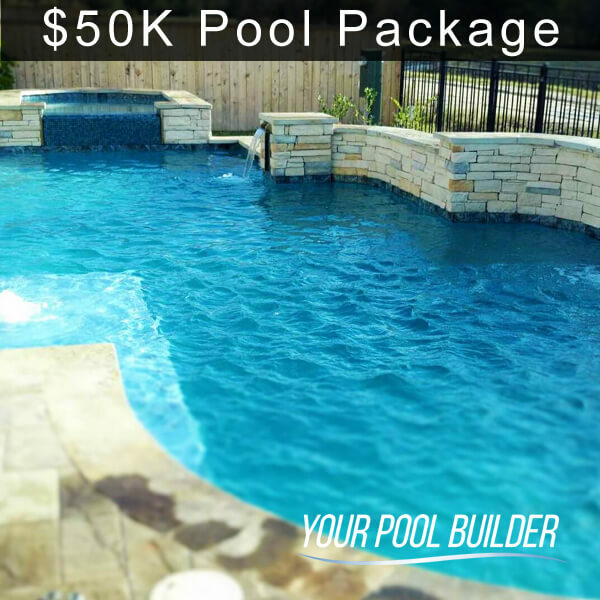 By educating you about swimming pools in general, we find that you can make a more sound decision when comparing your wishlist to the budget. 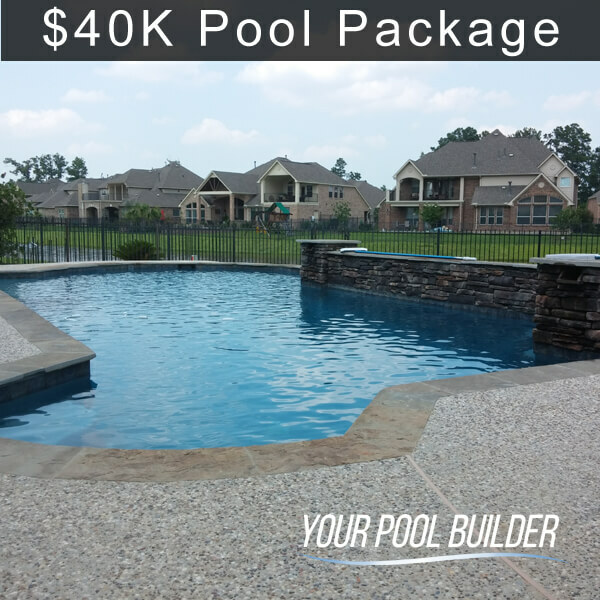 To help establish a reference point of the cost of a new concrete swimming pool we have created several “packages” that give you the option to upgrade, interchange materials, equipment or specs. There are no 2 exactly equal swimming pools, in terms of what it took to install both cost and requirements. To even the smallest degree there can be certain challenges just to get a pool into a backyard. 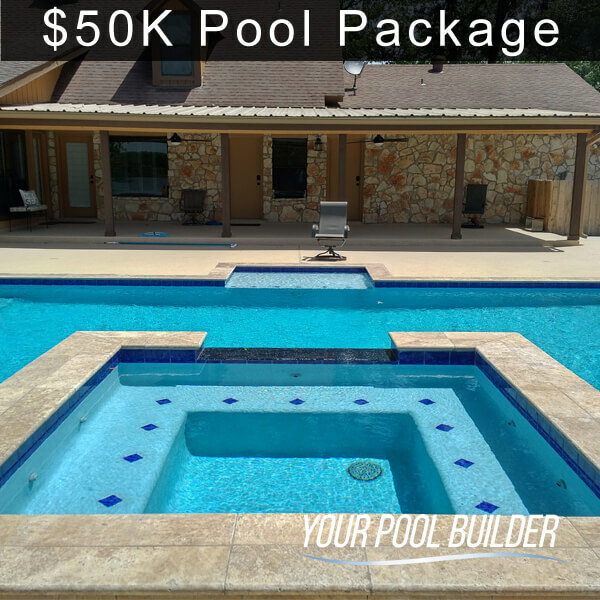 Offering you a standard package pool is just one simple way to build up to your maximum budget with customization options while considering the structural costs first, and adding the extras later. Customized design features are added to the top of a base construction total, by line, allowing you to understand how the total cost for construction is achieved. There is no credit check to get an accurate pool price! When it is time to decide on who you feel most comfortable building your new swimming pool, consider who gave you the most educational information. Which pool designer was more focused on your needs, desires and goals rather than up-sales or extras? Were any of the sales representatives that you met with focused on making your pool easy to service when it is completed? Questions like these are the ones you should be asking yourself, because the type of swimming pool contractor that sells from this angle actually has a passion and drive for the best possible outcome of your project. Let’s face it, at it’s most simplest form a swimming pool is a predefined hole in the ground that can hold water with a pump system to circulate it. Really simple stuff, right? Simple until you’ve seen the vast designs we can achieve with concrete, and that’s what makes it so awesome to own a custom swimming pool. The cost of such things are optional for those who just want to float in their backyards, and there’s nothing wrong with that. For others, the swimming pool is more about a total backyard experience. There is no shortage of optional swimming pool features, equipment, gadgets, and accessories one could consider when planning a new pool. We seriously can’t name them all here, but you can get the idea – sky is the limit. Here’s the catch, each item comes with a price. 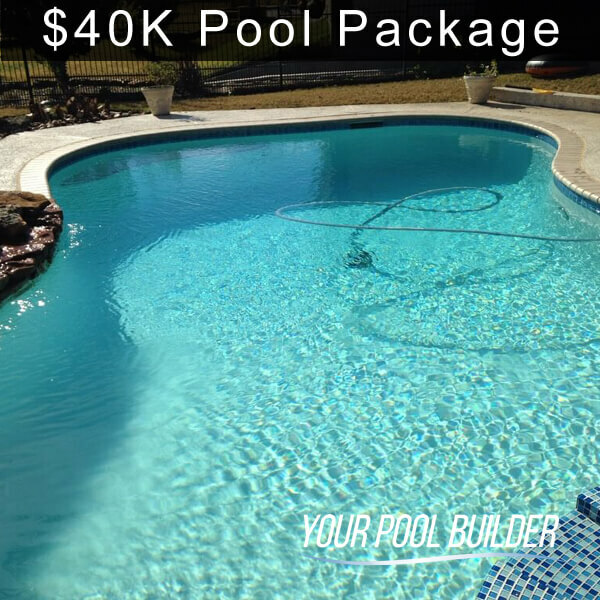 A swimming pool contractor should deliver an estimate that includes a breakdown of what the base price for the swimming pool (and or spa) is without all of the extra stuff. 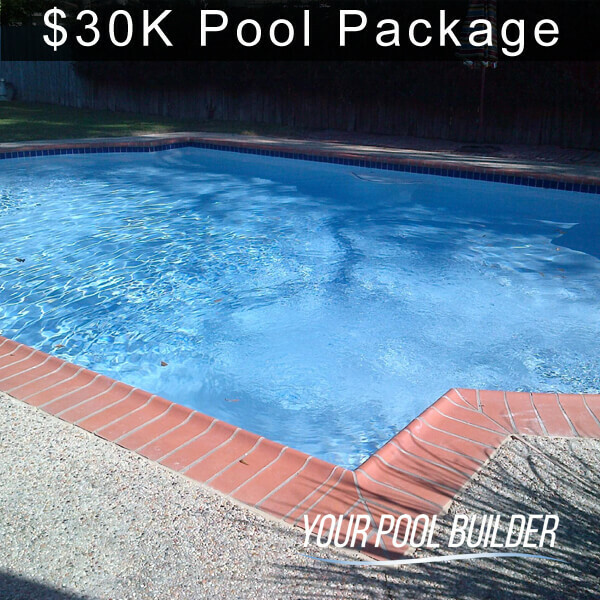 This way you know the price of the pool, and room in the budget to add or eliminate any other extras. Remember, there are going to be minimum requirements affecting the price associated with even a “basic” swimming pool. Are you ready to get swimming yet? 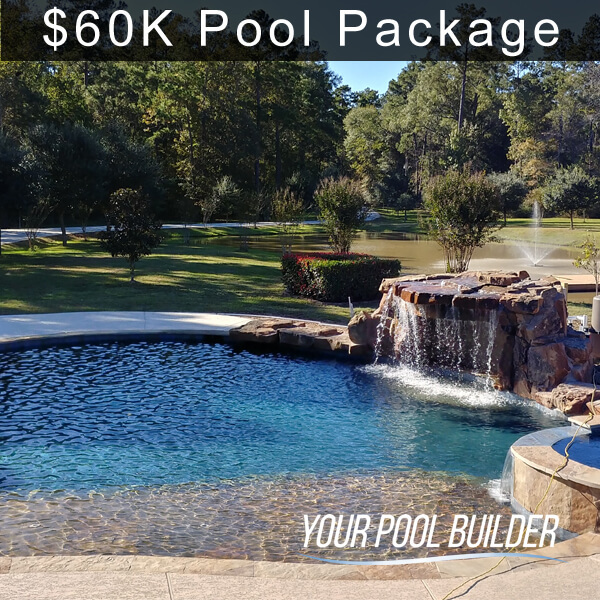 If you are reading this far, it means that your are serious about getting a new pool, so let’s have a look at some real projects and their contributing factors to the final prices, see below. Features Included: Sun Ledge, Bubbler, Fountains, Glass Tiles, Pebble Interior Finish, Stamped Concrete Decking. No matter what optional extras you may add to your pool design, there will be some (hopefully few) hard-line cost items associated with the construction of a swimming pool no matter the size, shape, or otherwise if not by the virtue of installing a pool period. Certain landscape features such as extreme elevation changes, or tight spaces, large easements or etc may create an initial budget hurtle that will need to be overcome. 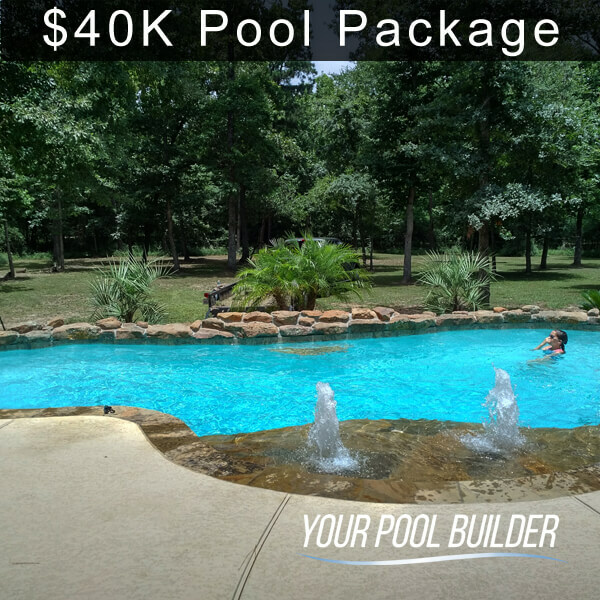 For example, in our current Market, Texas, swimming pools in the city limits of San Antonio may cost more on average than the same pool just north of Houston in Montgomery County Texas. The reasons for this extend from the types of soil, hillside vs flat terrain. Texas has a vast diverse landscape and this is how swimming pool prices can change within a region or even by state in the US. Type of Pool: In this article we speak to concrete pools, but there are also less expensive alternatives that offer less options. The pros and cons of different swimming pool types is a lengthy discussion. Size: The overall size of the swimming pool structure is what makes up the bulk of cost, second to that would be the plumbing and equipment and decking surface. Decking: Concrete flat-work or other surrounding surfaces designed properly and especially in expansive designs can add considerable costs to the base amount of the pool. Location: By nature of engineering & application, a swimming pool on the lake-front will cost more for the same pool built in a flat field. Optional Extras: This is where all of the little things can add up, as mentioned above there is a very long list of pool lighting, wireless devices, design customization, fire & water features, or accessories but you may find them to be very affordable. Local Requirements: City permitting and code enforcement (if applicable) costs will be passed down to the homeowner, although even when outside of the city permitting zones we follow all specs as if they were to be inspected, because at some point in the future you may sell the house and if the pool contractor skimmed on the building codes you will find out the hard way. After Effects: Many times homeowners may need to re-zone or add new sprinkler zones, or landscape lighting for the new backyard design. Repairs to the landscaping and fencing could be a potential added expense once the pool is completed. In the distant past owning a swimming pool was sort of luxury, but in today’s time swimming pools are affordable and cost effective to own in the long term. With most pool maintenance plans being not much more than what you normally pay the lawn guy, you can get professional routine service at good rates. Run your Single Speed pool pump as little as possible. Upgrade your pool pump to a Variable Speed version.